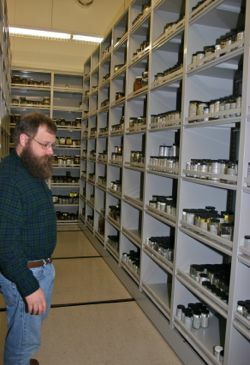 Collections The majority of specimens in the VIMS Fish collection are stored in screw top glass jars with polypropylene lids and polyethylene liners. The specimens are bathed in 70% ethyl alcohol. Photo by David Malmquist. Tour Group Members of Christopher Newport University's Lifelong Learning Society visit the VIMS Fish Collection during a 2007 visit. Then collection manager Paul Gerdes (facing camera) leads the tour group. Photo by David Malmquist. Outreach Graduate student Dan Dutton (C) describes a specimen from the VIMS Fish Collection during Marine Science Day. Photo by David Malmquist. The Nunnally Ichthyology Collection at the Virginia Institute of Marine Science has been selected to participate in the Museum Assessment Program, which offers guided self-study and on-site consultation with a museum professional to help VIMS staff better serve both the scientific community and citizens of Virginia and the Chesapeake Bay watershed. The Museum Assessment Program (MAP) is funded by the federal Institute of Museum and Library Services (IMLS) and administered by the American Alliance of Museums. As part of the IMLS National Leadership program, MAP advances best practices and fosters improvement in museums nationwide. MAP is a self-motivated endeavor; application to and participation is initiated by each local institution, and those accepted invest considerable human and institutional resources into the assessment. Leading VIMS' participation in the program is Collection Manager and research assistant professor Sarah Huber. 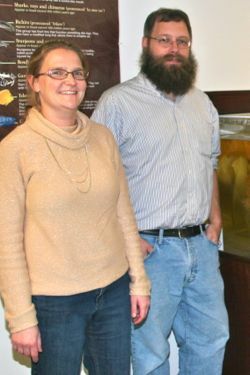 The Nunnally Ichthyology Collection is an integral part of VIMS’ three-part mission of research, education, and advisory service and serves a broad community of basic and applied research scientists and fisheries managers, as well as providing an important resource for local community outreach. Through its 60-year history, the Collection has grown from an un-catalogued teaching collection to become the largest repository for freshwater, Chesapeake Bay, and coastal fishes in the Commonwealth of Virginia. This growth has been achieved through the research and collection programs of its curators, other VIMS faculty and staff, and graduate students, as well as through acquisition of orphaned collections. MAP is a confidential process of self-study, peer review, and implementation. Museums use the assessment process to strengthen operations, build capacity, and enhance communication throughout the organization and in response to community needs. Small and mid-sized museums of all types—including art, history, science and technology, children’s, natural history, historic houses, nature centers, botanical gardens, and zoos—participate. Since its creation in 1981, MAP has served more than 4,300 museums. It is supported through a cooperative agreement with IMLS, the primary source of federal support for the nation’s 123,000 libraries and 17,500 museums. AAM represents the nation’s entire museum community and has been dedicated to promoting excellence within the museum field for more than 100 years.